Fringing the coast of Kerala and winding far inland is an intricate network of innumerable Lagoons, Lakes, Canals, Estuaries and the Deltas of forty-four rivers that drain into the Arabian Sea. Over 900 kms of this labyrinthine water world is navigable. As characteristic of Kerala as the 600km long coastline of dazzling beaches is the dense, lush Backwaters of the Kerala state. And while hill stations are all over the country and palm-fringed beaches too, the Backwaters are unique to Kerala. These Backwaters are both the basis of a distinct lifestyle and a fascinating thoroughfare. Travelling by boat along the Backwaters is one of the highlights of Kerala. The boats cross shallow, palm-fringed lakes studded with cantilevered Chineses fishing nets and travel along narrow shady canals, where Coir, Copra, and Cashews are loaded into the boats. The largest backwater stretch in Kerala is the Vembanad Lake, which flows through three districts and opens out into the sea at the Kochi port. Backwaters are the accumulation of Sea Water at the sea beach during the to-fro motion of sea-waves in the form of lagoons, esturies etc. Today, Kerala Backwaters has become the most exciting tourist spot in India. The Ashtamudi Lake (literally, having eight arms), which covers a major portion of Kollam district in the south, is the second largest and is considered the gateway to the Backwaters. Each district of Kerala is marked by the presence of the inviting Backwaters, which form a prominent part of the panoramic landscape of Kerala. Have you ever gone houseboat cruising on the backwaters of Kerala? If you havent, make sure you do. This ones really an absolutely wonderful, unforgettable experience! Traditional Kerala houseboats, Kettuvallam, glide past, powered both by gondolier-like boatmen with poles and by sail. Kerala's houseboat cruising is not just restricted to the backwaters, you also get a chance to explore the wildlife and indulge in some water sports such as water skiing, water sailing and angling. 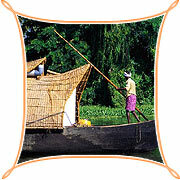 The most popular backwater cruise is from Kollam to Allappuzha.